When someone does something wrong, how often is it that they confess to it and ask for apology? Rarely does one actually pen a letter to confess their mistake. 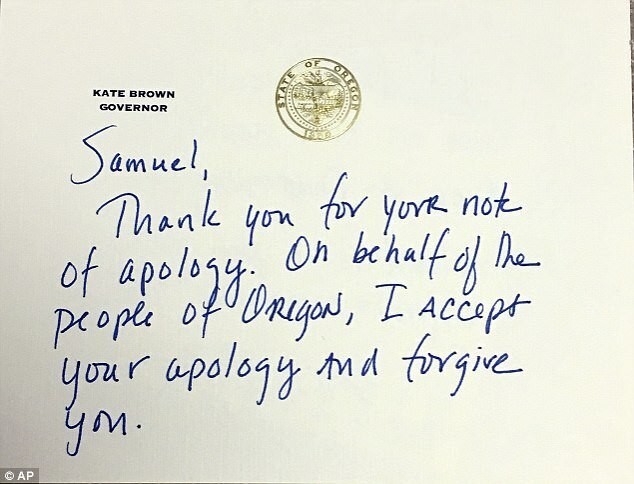 But recently, Governor Kate Brown of Oregon received a handwritten letter from a fourth-grader, in which he confessed to stealing and asking for an apology. This episode may seem like a minor crime scene considering some items were stolen from the State Capitol Building, but it ended up so cutely that you would be proud of the boy, named Samuel Revenko. Samuel had gone to the Capitol Building on 19th April on a class trip and had stolen a pen and a hazelnut. But he recently, sent a handwritten note to the Governor, asking for forgiveness. He confessed that he had taken a pen and a hazelnut from the Capitol Building. He further added, These things were not mine and it was wrong for me to take them. I’m very sorry. I hope you and the people of Oregon can forgive me.’ The boy had even sent the pen back, along with one dollar, as compensation for the hazelnut. Governor Brown was so moved by this confession letter that she also wrote a letter back to him, accepting his apology on behalf of the people of Oregon. When we get to see such gestures from people in power and the little kids whose moral characters are still building up, we all feel that world is not all that bad, and humanity certainly has its preservers among us. Share this story with your family friends to show the cutest confession letter one can ever see. Previous articleHow Is Everyone Reacting At Raksha Gopal Topping CBSE Class 12 Boards With 99.6%?